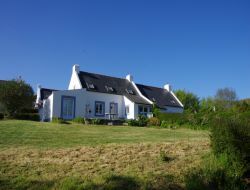 Renting a nice holiday house in Belle Ile en Mer, in the small hamlet near Kerouarc'h close to Locmaria, 10 minutes walk from the beach. Possibility 2 families with young children. On foot or by bike discover "The Pearl of the Gulf", the Ile aux Moines welcomes you. Enjoy its beaches, walks and enjoy your holiday at another pace. This recent house, classified 3 * offers you calm and comfort. Enclosed garden with sea view, beach 200m, large terrace, barbecue. 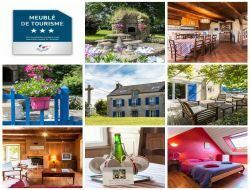 Located in the town center, 300 m from the green lane n ° 7, the Gîte des Montagnes Noires welcomes 4 to 6 people (2 bedrooms) for a family holidays in the Morbihan in central Brittany , throughout the year. You will be 40 minutes from Lorient, Pont Aven, Concarneau, Quimper, 15 minutes from Carhaix (Vieilles Charrues), 30 minutes from Huelgoat and 50 minutes from Benodet. 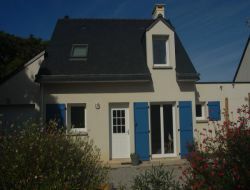 Holiday home in Sarzeau, in the Gulf of Morbihan. House with all modern conveniences 6 places, side countryside, at 4 km from the beach of Susinio and 2 km from the city center. 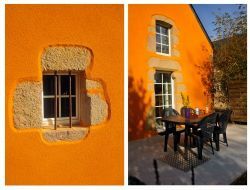 In Morbihan, in the heart of Brittany, holiday cottage for 5 persons, near the Canal from Nantes to Brest. Hunvre Dihun, opened all year long, rent weekly, small week or weekend except seasons. You will find to Hunvre Dihun the alliance of a traditionally Breton decoration and the modernity with a free wifi internet access. 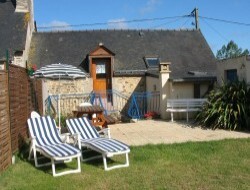 Located 150m from the beach, the cottage can accommodate 2 or 4 people with all the comforts for a successful holiday. 2 bedrooms upstairs will fit the dimensions of your family. Located 10 minutes from the expressway, the cottage is in the heart of a tourist area from the peninsula of Guérande, the Gulf of Morbihan and the peninsula of Quiberon. You benefit from a parking space in front of the cottage, which allows you to conduct your tourist getaways in the best way. Reserve your holidays on the Ile d'Arz, one of the two pearls of the Gulf of Morbihan. 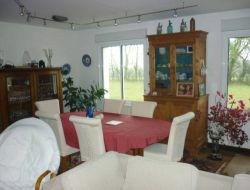 Holiday homel for 7 people (3 bedrooms) at the heart of the village and in 200m from the beach. 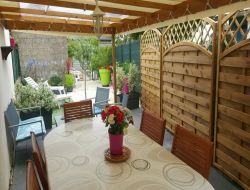 Enclosed garden to have some good times in family or between friends. 18 km of coastal paths has to discover by walks or in bike. 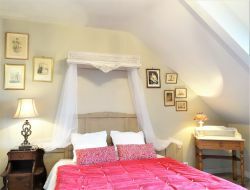 15km from the sea, the 3 stars gite completely renovated, being able to welcome 8 persons ( 4 bedrooms), in countryside. Calm, wooded garden, terrace, barbecue. Gite situated at 4 km from the Zoo of Branféré.